My name is Miranda Johnson and I am from a small town in NC. I live with my two children ages 11 and 18 as well as my husband of approximately 19 years who are my support system. Although my RA symptoms started when I was around 8-9 years old, I was not properly diagnosed until I was 18 with a seropositive reading. With my early symptoms as a child, doctors would look at me as though I were a monkey in a cage only giving me antibiotics. Once I became older and symptoms progressed I did see physicians taking my disease more seriously. My RA is classified as severe/chronic effecting all joints and some organs. The best advice that I could give anyone who is newly diagnosed is not to be scared of the medications available today. RA is a progressive disease that needs a progressive approach. Much joint damage cannot be corrected so the quicker you get yourself into remission , the better. Stay active and positive the best you can. The world does not stop for ourselves having a bad day but if you are then cry, wipe your tears and remember that you are still going and that’s what counts. Any chance you get to advocate for our disease, take it! We need a cure! If a cure isn’t found in your lifetime then advocate that one is found for your children’s lifetime! On the final day of this year's American College of Rheumatology (ACR( Annual Meeting, while I was manning our booth, a physician from another country stopped right in front of our table and said, “YES! That is so correct! This is the problem people don’t understand.” He was referring to our background which was of one of our billboards with arthritis crossed out, disease written above it and the tagline that arthritis is just one symptom. We talked for quite a while about the many facets of this disease that are misunderstood such as the increased risk of heart and lung issues and the need for better understanding that this is a multifaceted DISEASE. The opportunity to attend ACR in October 2018 was an incredible blessing. I went understanding that my primary role was to represent patients and to be an advocate for us in the midst of physicians and pharmaceutical companies. Not only was I able to do that, but it was like being in a different world for a few days, a world that spoke my language. Since my diagnosis nearly 7 year ago, I have relished the moments where I have felt understood. There have been few. So often someone will ask me what medications I am on to treat my disease and if I give the real answer, I can tell it’s too much. Why wouldn’t it be? It is so much to understand - DMARDS, biologics, biosimilars, and all with various points of entry on the immune system. All of that was different at ACR. While I was there to educate on the patient experience, I was also a learner and soaked up everything I could about our disease. Here are my takeaways as a newbie to this yearly conference. 1. We all have so much to learn. Not only do physicians and pharma need to learn about US and our experience, but we need to continue to educate ourselves about this disease process. As a patient, I need to keep reading, researching and then advocating. While we can’t all decipher numerous research articles, we can utilize the resources available such as Kelly Young’s book that does a phenomenal job of combining research with patient experience. I’ve considered myself to be an educated patient, yet after reading Kelly’s book and attending ACR I have been able to advocate for further testing for myself in regard to my heart and lung functioning. After learning what I did, I could no longer ignore or deny the symptoms I was having. 2. Pharma is not the enemy. In our cynical world it is easy to fall into the, “Pharma doesn’t want the cure for _ because then they would lose money.” I saw the passion in the folks we talked to. They DO want to make our lives better. Bringing a single drug to market carries significant costs, and most don’t make it there. We must continue to work with them so that the patient experience is always at the forefront. That is something RPF is extremely committed to doing. 3. We must ramp up our collective efforts to advocate for patients with Rheumatoid Disease. RPF is the only organization dedicated solely to Rheumatoid Disease and our board recognizes how important it is that we continue to put a focus on our particular experience. Arthritis is just one symptom for us and until the world understands that, our mortality rates will be too high and we will continue to be misunderstood and undertreated for the many facets of this disease. 4. There is HOPE. I will admit that going in, I was feeling a bit defeated individually. I’m one of the patients who has been on multiple biologics (8) and other medications, with little or short lived response. It’s hard to have hope, when the list of possibilities is dwindling. Seeing RPF connect with the many pharmaceutical companies’ patient advocates and knowing they are vested in how they can help beyond providing medications was heartening. My most hopeful moment is what you see in this photo. Every day there was a poster session where the researchers would present their results and be available for about an hour to answer questions. After the big rush on the last day, I went up to this upper area where you could see the whole gallery. Just look at all the research being done! These displays are double sided and were changed out for 4 days! That is a lot of research that has the potential to change our lives. 5.We must continue to bring in our healthy counterparts. The Rheumatoid Patient Foundation now has several board members who do not have the disease, but are vested because their loved ones do. Their support is instrumental in this fight. Often the people that love us feel helpless to change anything for us. Letting them know they can get involved in advocating with us takes some of the burden off us and allows us to draw from their strength. We must be open to this help. As a brand new member of the Rheumatoid Patient Foundation Board, I was thrilled to be able to attend the 2018 American College of Rheumatology (ACR) Annual Meeting in Chicago this fall! The four-day event, highlighted rheumatology developments and drew medical professionals and researchers from around the world. It was an eye-opening experience! The amount of information at this conference was overwhelming but at the same time, informative, encouraging and made me even more committed to RPF’s mission! 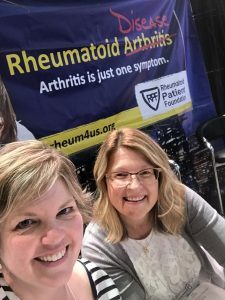 Most of the RPF board members were able to volunteer to work in the Rheumatoid Patient Foundation booth and we talked to many people who stopped by, i.e., doctors, nurse practitioners, researchers, pharmaceutical reps, and people living with rheumatoid disease. Attending this conference has made me deeply aware of what my friends and family with rheumatoid disease have to live with on a daily basis. Since I do not have RD, I can never truly know what it must be like, but I can try my best to be supportive, sensitive and another warrior in the fight to spread awareness and pray for a cure for those who suffer. The main point I left the conference with is the fact that research previously and currently taking place is moving forward daily to improve the health and lives of people who live with rheumatoid disease. We are all fighting for changes & improvements that will improve the quality of life for millions of people. Seven years ago, I had my first volunteer experience with the Rheumatoid Patient Foundation. It was also my first time attending the American College of Rheumatology Annual Meeting, which was held that year in Chicago. It was an experience that changed my life. It was eye-opening and exciting as I saw so many people from multiple disciplines coming together with the goal of helping people with rheumatic diseases. 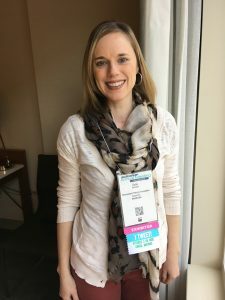 It was also where I got to meet some long-time internet friends face-to-face, including RPF Founder, Kelly Young, several other patients, and some rheumatologists that I knew from around the globe. The experience gave me hope that by working together, we really can improve the lives of people with rheumatoid disease and work toward a cure. This year’s ACR Annual Meeting brought us back to Chicago – and me to my sixth time attending this annual conference with RPF. Looking back, it’s fun to see the progress that has been made since that trip seven years ago. Back then, we were just about the only patients to be found at the conference. Over the years, that has begun to change and the ACR has been more open to involving patients in the conference, even having a special section of patient poster presentations in the poster hall, and having more conversations and sessions that are patient-centric. There seemed to be a general attitude shift, where a number of years ago we received push back from some people who seemed to think that we had “arrived” at the pinnacle of what was needed in rheumatoid disease treatment and that patients were doing just fine. Whereas this year, we received no push back, and instead were embraced with open arms by other attendees (doctors, researchers, biotech and pharmaceutical employees) who see the need for more and better resources for people with RD and for heightened education and awareness of the true nature of this systemic disease. We offered free copies of the book, Rheumatoid Arthritis Unmasked, and educational “Treat to Target” posters for doctors’ exam rooms. We had an overwhelming response, with requests for resources from doctors in nine different countries! Other things have changed, too. New drugs have come on the market – including new oral medications, auto-injector pens for methotrexate, and biosimilars. Biosimilars have been a huge topic of conversation for the last few years. A biosimilar is kind of like a generic version of a drug, except that since these medicines are made biologically rather than chemically, they are not exactly the same as the branded drugs. They offer a potential cost savings and theoretically similar response rates as their branded counterparts – though there’s some debate about whether the branded and biosimilar drugs would work the same way in a particular individual. There are also new drugs still in the pipeline that offer future hope to people who have not responded to current treatments on the market. On the whole, this year was a very positive experience, and it feels like we have come full circle back to Chicago, and back to a place of hope and possibilities. We set things in motion in 2011 and have made some strong headway toward our goals of patient involvement, recognition of RD as not just arthritis, and support for our educational and awareness campaigns. There is lots of work yet to do on all fronts, but it seems that in many ways, things are headed in the right direction. Let’s fight together to keep this momentum going until we reach our final vision: a world where no one suffers from rheumatoid disease. We at the Rheumatoid Patient Foundation believe that our personal stories are powerful tools of education and inspiration. 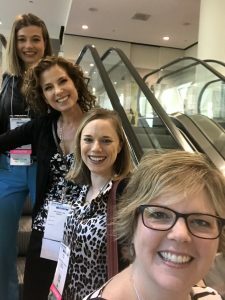 We have asked several of our volunteers to share a part of their journey and volunteer experience with us after joining us at the American College of Rheumatology Annual Meeting. If you are interested in sharing part of your story, please click here. I had a fantastic time at the ACR. I did not realize that there were so many people who have Rheumatoid Disease, along with so many Rheumatologists and prescription drugs. I thought this was going to be somewhat local, maybe in a tri-state area. To see all of the rheumatologists from all over the world was amazing to me. It was very educational to learn that Rheumatoid is a Disease and not just Arthritis. Besides finding out that RD affects joints, but also tendons, ligaments, bones and muscles. I did not really understand this. It was fun talking with the doctors, drug companies, and anyone else related to Rheumatoid Disease. 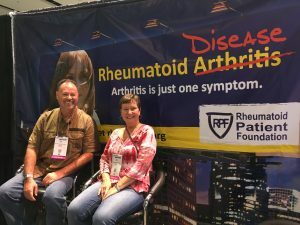 Anita (my wife) and I enjoyed explaining what the Rheumatoid Patient Foundation was, that I have RD, and getting them to sign up for a free copy of [RPF Founder] Kelly’s book (Rheumatoid Arthritis Unmasked) and/or a poster for their offices. It was a great learning experience. My name is Eddie Franklin. 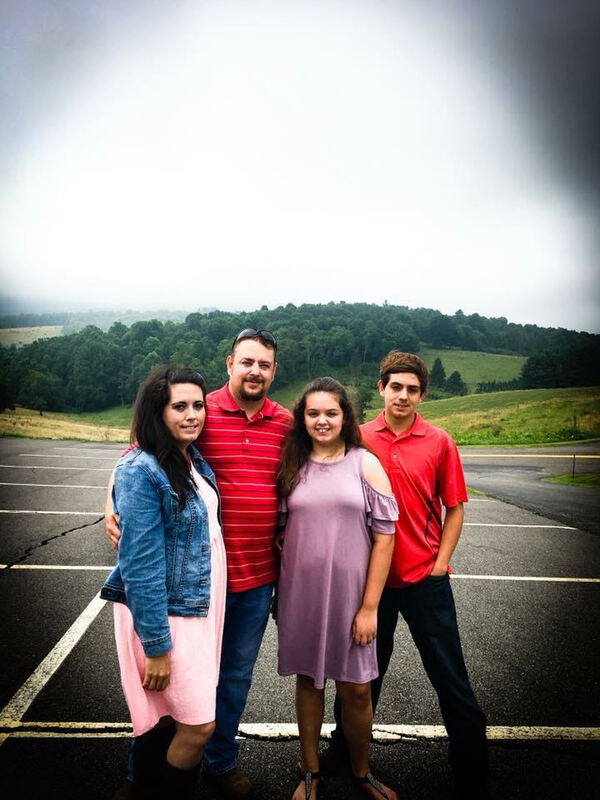 I am blessed to be married to Anita for a little over 12 years, I have two step children, Jonathan and Dana, along with two grandboys, Gary and Clark. I live in a small farming community in Charlotte, MI. 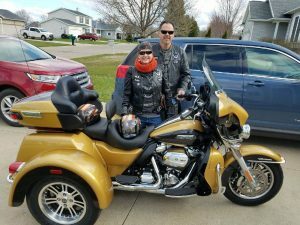 My wife and I enjoy motorcycles, the S.O.A.R. motorcycle ministry which we are proud to be members of, along with serving the Lord whenever possible. We love beach vacations when we can get away. I was officially diagnosed with Rheumatoid Disease about four years ago, maybe a little longer, but I need to back my story up just a little. I was involved in a serious car accident back in February, 1986. I have been suffering with a Traumatic Brain Injury (TBI), along with Seizures. I have developed different medical problems ever since. About eleven years ago, while living in Livonia, MI, my joints started swelling and really hurting. I was in a tremendous amount of pain. My fingers and ankles really started to bother me. I was taking between 6 to 8 Aleve a day. I needed something for the pain. I thought it had something to do with my car accident. My wife talked with her daughter Dana, my stepdaughter, who has RD. She recommended her rheumatologist when she lived in the area. I went and he did the typical tests and said I did not have Rheumatoid Arthritis. He told me not to take too many more of the Aleve a day because it could eventually hurt my stomach. All I know is that there was something wrong. As days went by, I was feeling worse. My hands, feet, ankles, knees, and hips were all starting to hurt. Again, I just thought this was from my car accident. It was difficult for me because I was having problems holding up my motorcycle. I dropped it a few times. My ankles just wouldn’t let me hold it up. I was starting to think I was going to have to give up on one of my true passions, riding. We have since moved to Charlotte, MI. The problems in my joints were hurting me really badly. Some of my fingers are bent and my joints hurt. Sometimes my hands even go numb. Again, Anita talked with Dana about my problem. She said that I have RA. That it can go undiagnosed in the blood work. She recommended her doctor in Grand Rapids. He agreed with Dana, that I had RA. He started giving me methotrexate and prednisone. After 3–4 weeks, I could not believe the difference. I had movement in my joints, something I haven't been able to do without pain. Do I still have pain, yes, but not near as much. 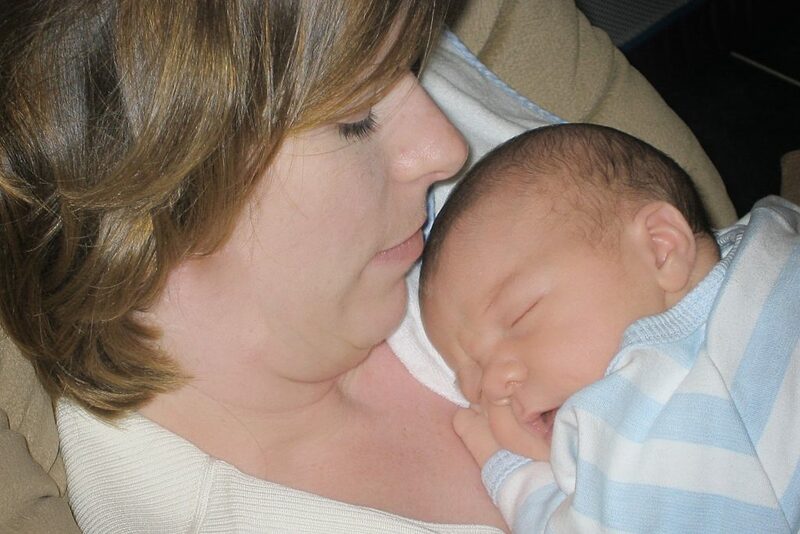 About 4 months later, the methotrexate was not working like it did. My doctor changed my medication to Humira. This time it worked for over 7 to 8 months, maybe a little longer. When it slowed down working, he changed it to Enbrel. Again, maybe 7 to 8 months and I still started to have pain. Now I am on Orencia. I still suffer with pain, but it seems to be working. I am grateful to the Rheumatoid Patient Foundation. I just did not realize the meaning of Rheumatoid Disease. I learned that arthritis is just one part of the disease. After working at the ACR in Chicago, I feel I am starting to be better educated on RD and now if I have any questions or want to share my experiences, I can. I am thankful to my wife Anita and stepdaughter Dana. Both are very intelligent women who do their homework. They do not take no for an answer. Do I still ride my motorcycle and serve in the S.O.A.R. 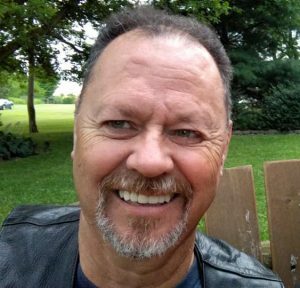 motorcycle ministry? Yes I do. I did have to switch from two wheels to three. But, even though I am still in some pain, I am able to serve the Lord. For the past few years, the Rheumatoid Patient Foundation has run an annual scholarship program to support students affected by Rheumatoid Disease. Our goal has been to expand the program each year. This year, we have upped our Scholarship Program to award five $1,000 scholarships to students who are affected by Rheumatoid Disease. We'd like to take a moment to thank everyone who applied for our Scholarship Program. We received many wonderful essays and applications. Our judging panel has chosen our five winners this year, and we'd like to introduce each of them to you. Please join us in congratulating these five individuals! 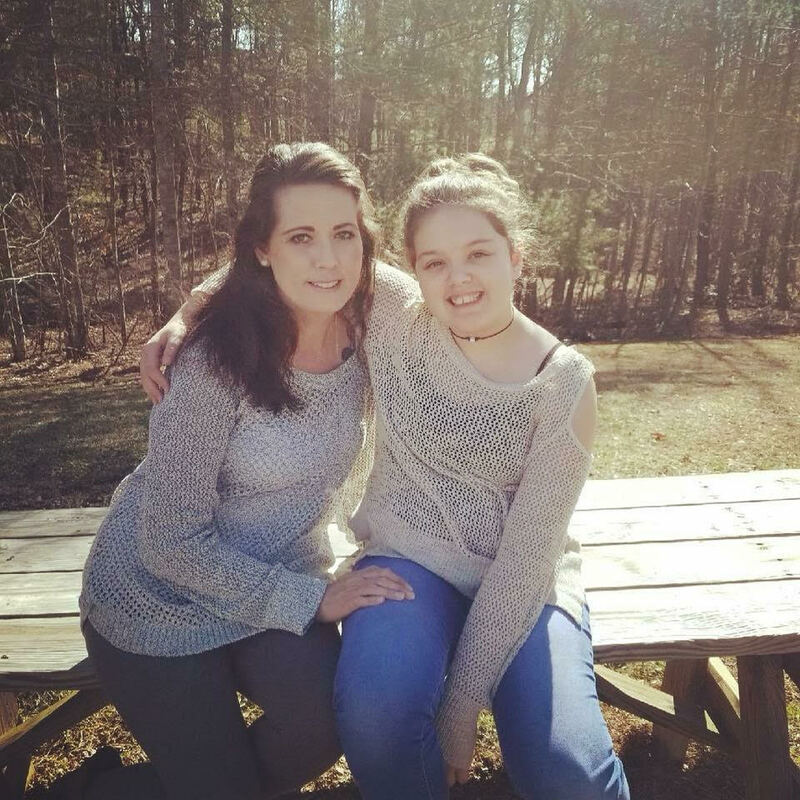 Michelle was diagnosed with Juvenile Rheumatoid Arthritis at age 11. 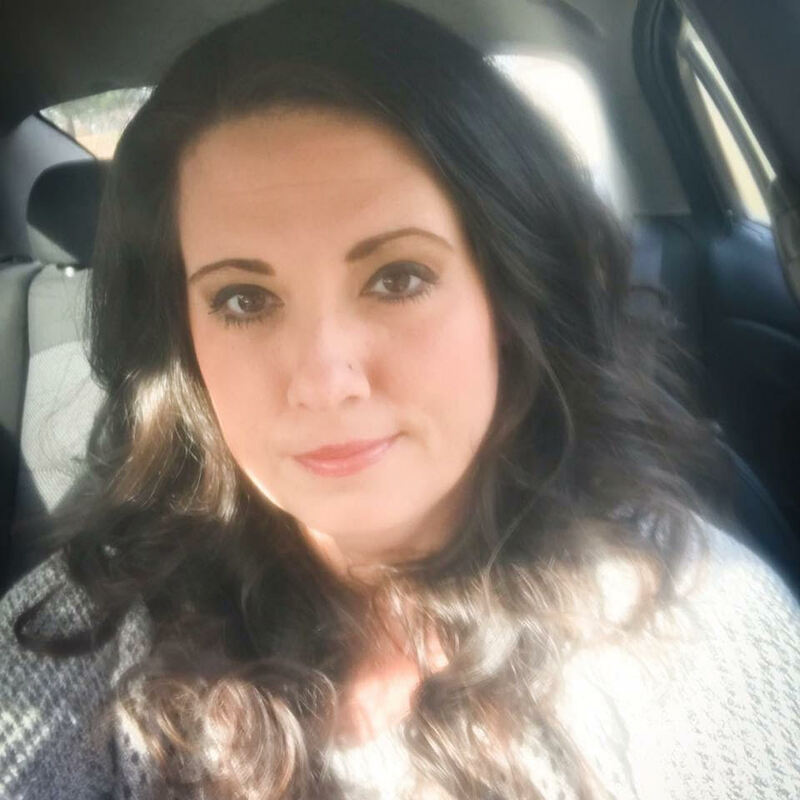 Her experience with the healthcare system has made her committed to pursuing a career aimed at improving quality of care and access to care for underserved communities. She is currently pursuing her Master’s in Public Health with a concentration in Health Policy & Management. I am from Charleston, SC and am currently a freshman at Wake Forest University. My academic interests include English, Spanish, and visual art. Outside of the classroom, I love to stay active, participate in community service, and spend time outside. 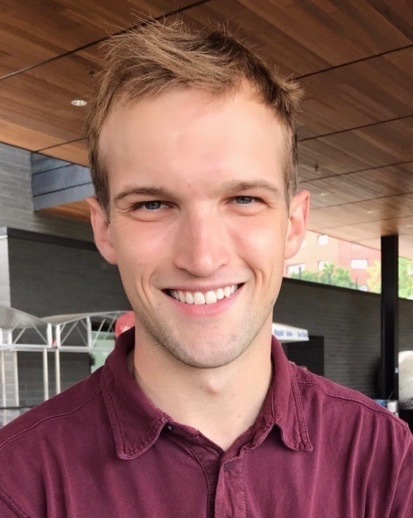 Maxwell has lived most of his life in Minnesota, where he earned his Bachelor of Arts degree in political science from the University of Minnesota. Maxwell was diagnosed with polyarticular juvenile idiopathic arthritis at age 17 and has benefited from immunosuppressive drugs. He now lives in San Jose, California and attends Santa Clara University School of Law in Santa Clara, California. Maxwell plans to focus his studies on international law and public interest law. My name is Ashley and I was diagnosed with JRA at age 13. Fast forward 9 years, I am now enrolled in a doctoral program for clinical psychology at Pacific University in Oregon. 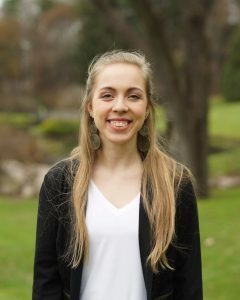 Within clinical psychology, I am studying health psychology because I am especially interested in how physical health and mental health influence each other. I am also adding an emphasis in Latinx psychology to be able to serve Spanish-speaking populations. I am grateful to the Rheumatoid Patient Foundation for letting me share my story and I hope to use my experience with arthritis to help those in similar situations. My name is Elizabeth Roach. I have had Juvenile Rheumatoid Arthritis since I was 14 months old. I am currently in my first year of graduate school for Child Life at Edgewood College in Madison, Wisconsin. 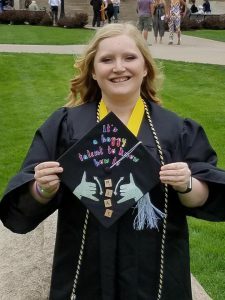 I completed my undergraduate degree at the University of Iowa in Therapeutic Recreation. I am really looking forward to my future working in hospitals to help children like me who have chronic illnesses as a Child Life Specialist. Many thanks to all who applied to our Scholarship Program this year. Congratulations to this year's winners, and we look forward to seeing what your futures hold! A special thank you to our sponsor, Crescendo Bioscience, for making this Scholarship Program possible! By sharing our own stories, we can offer hope and encouragement for others and let people with Rheumatoid Disease know that they are not alone in this fight. 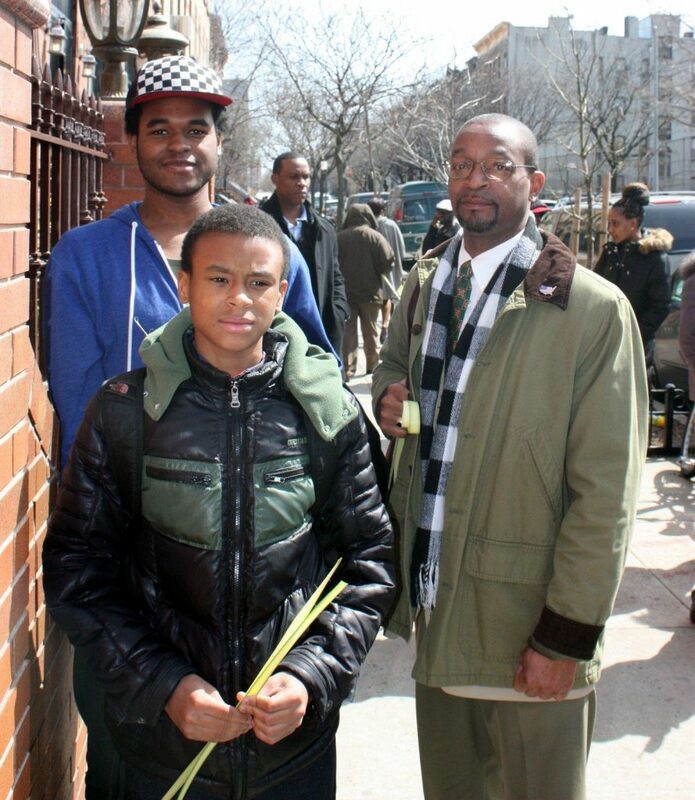 If you're interested in sharing your story, please visitour story page. My name is David St. Martin and I am from Shrewsbury, Massachusetts. When I’m not working full-time, I enjoy spending time with my daughter and participating in outdoor activities such as kayaking, sailing, scuba diving, indoor rock climbing and more. Throughout childhood, I was in and out of hospitals and in and out having to use a wheelchair, graduating high school as a wheelchair user. 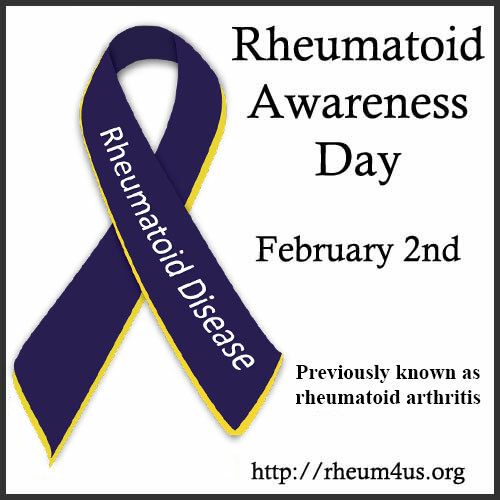 I was diagnosed with systemic, polyarticular Juvenile Rheumatoid Arthritis at age 2, more than 4 decades ago. The onset of my disease appeared as rash on my trunk, along with high fevers and joint pain, primarily in my hands and knees. Severe joint deformities occurred so rapidly that I became wheelchair bound. I consider myself lucky. Lucky that I was so young when diagnosed. Since I have experienced pain and deformities throughout my life, I am unable to fully imagine my life without the disease. On a daily basis, my mobility is compromised, my activity can be limited, and daily pain fluctuates. A person with Rheumatoid Disease quickly becomes acutely aware of their body and how weather, activity, diet, sleep and other variables may affect it – sometimes on an hour-by-hour basis. Back in the late 60s, early 70s, my treatment consisted of gold injections, aspirin and experimental anti-inflammatory medications in conjunction with rigorous physical therapy consisting of stretches, heat/cold therapy and paraffin baths. In my teens, prednisone was introduced to mitigate pericarditis and surgeries began in my 20s. Surgeries consisted of but, not limited to, total knee and total hip replacements. Today, my disease is sufficiently controlled by prescription pain medication and an over the counter anti-inflammatory. 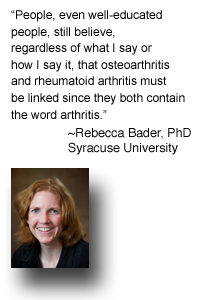 Rheumatoid Arthritis is not a bone or joint disease. It is not your grandparent’s deformed hands or the sports person’s sore knees. RA (or Rheumatoid Disease) is a chronic, systemic autoimmune disease in which the body’s immune system attacks organs and joints causing damage that may result in severe pain, deformity, organ failure and sometimes death. Remission is rare and currently there is no cure. Millions of adults and tens of thousands of children, including infants in the United States have a form of rheumatoid arthritis (RA). Personally, Rheumatoid Disease has affected most of my joints from my neck to my toes and has also involved my heart and eyesight. I consistently try to not let my disease define me. I do my best to live like someone who just happens to have RD. Admittedly not well, I try to eat healthy, sleep well and follow my numerous physician’s recommendations. I also push myself to experience life as best I can. 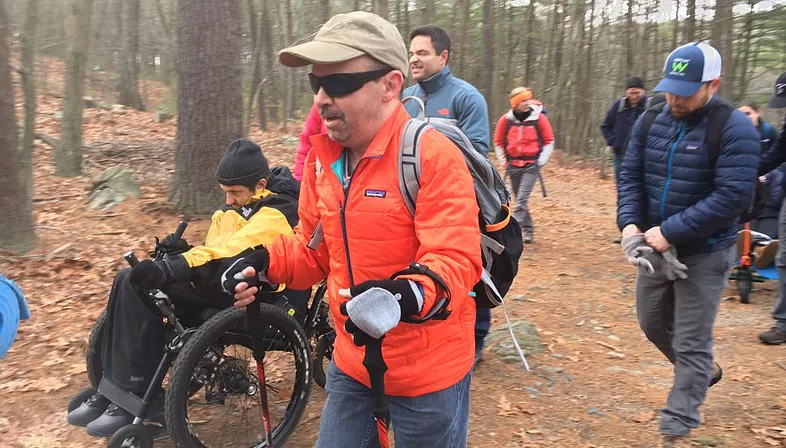 Several years ago, I decided to change my “disability” into “ability” and participate in outdoor activities. Working with several organizations that assist the disabled, I have had the opportunity to sail, kayak, rock climb, water ski and even became certified in Scuba Diving. Do your best to not dwell on the past. Try not to focus on what you have lost, instead focus on what you are still able to do. Try to accept your new “normal”. Do not be afraid to ask for help. Talk with a counselor, family, clergy and friends. Every day, try something new. Whether it’s adventurous as kayaking or as simple as getting out of bed. Rheumatoid Disease isn’t the end but, it is a new beginning. 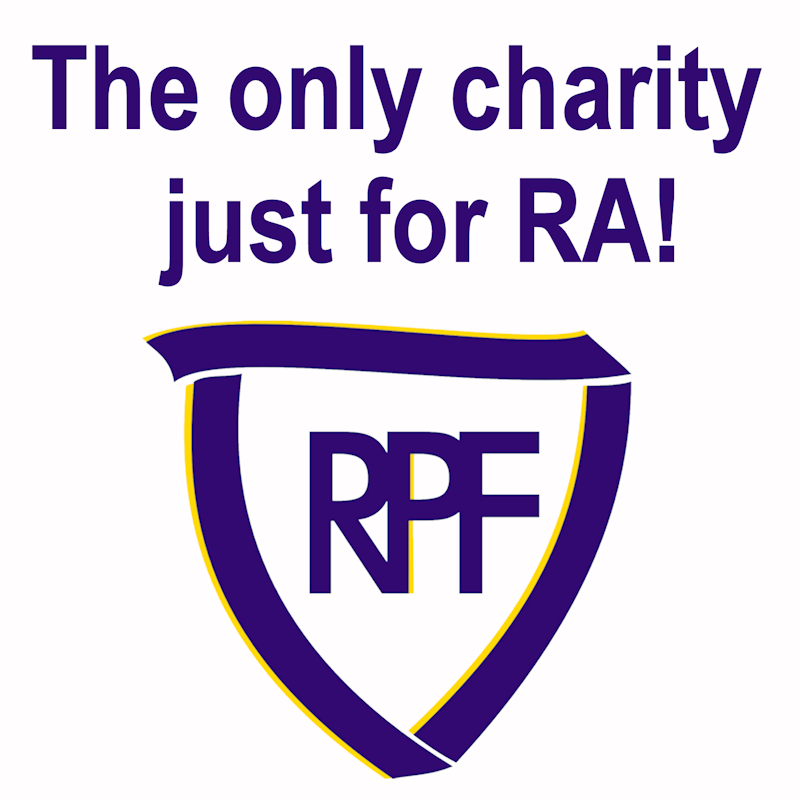 RPF sees the importance and value of sharing our own unique stories with rheumatoid disease. We love highlighting personal profiles on our blog to show the real people who are the face of this disease. If you're interested in sharing part of your RD journey with us, please contact us. 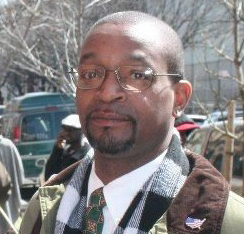 My name is Darnel McMillan. I was born in the Bronx, and am living in the Bronx but have lived in 4 of the 5 boroughs for about 10 years or more each. My passion is the study of religions and the Christian faith. My children are either college grads, in college or on their way to college this year (2018). I believe, if memory serves me correct, 2014. Pain in my right ankle, right knee, right elbow, right wrist and both shoulders. It kept me from financial gain and the lifestyle I enjoyed. What has been your experience with treatments for rheumatoid disease?? As long as I take the medications, my pain and/or discomforts are minimized to a certain degree. As time goes by, I notice my abilities continue to diminish. Keep in mind that I have RA throughout my body, not just in a particular area or areas. RA is extremely painful, incurable and should be place in the same category as cancer and all other high profile diseases for funding. Let's find a cure. Exercise, if possible, and wake up each day believing they have found a cure. Take your medication as prescribed; ask your doctor questions; voice your concerns; and live each and every day as you would normally.